The Metropolitan Regatta is our first opportunity to test our speed over a 2k regatta course against not only other university crews but club crews too. The weekend was a sunny and enjoyable one with many solid results and some close racing for us. First up on Saturday was our beginner sculler Kate Rice racing a single in Tier 4, she missed out on qualification for the final coming away with a fourth place in her heat. 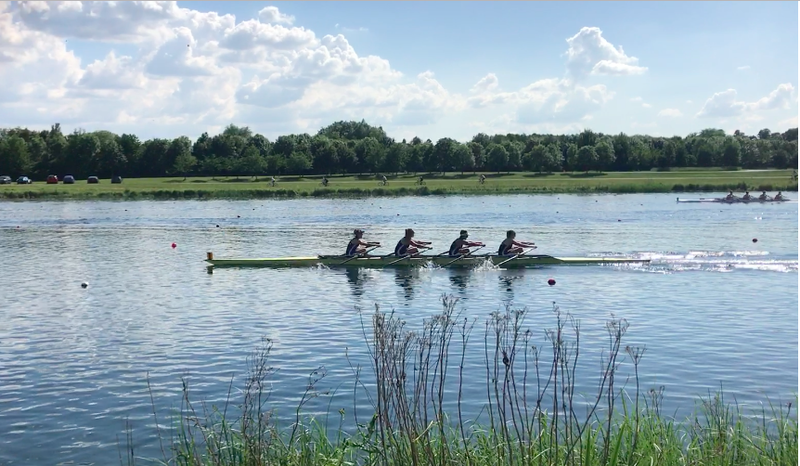 Next up our alumni quad of Mark Lewis, Simon Williamson, Vince DeLuca and James Robinson raced well to place second in Tier 2, a great result for Ortner, our alumni club. James and Vince also raced a double, again placing second in Tier 2 doubles. Following on from this our women's Tier 2 quad of Sophie Lewis, Beatrice Roe, Hettie Horler and Emily May came away with a third place. In the men's Champ quad we had three boats entered, the first boat (Rory Harris, Franklin Hamilton, Olly Dix, George Lawton) came in second place and the second boat (Luke Reiser, Laurence O'Connor, Sean O'Mahony and John Cooper) placed third, a great result to have two boats up in the top of Champ quads. Our third quad of Alex Badcott, Ollie Irwin, Rob McPherson and David Few missed out on qualification, placing fourth in their heat. Our women's Champ quad of Chloe Knight, Lucy Ryan, Fran Bratt and Anna Smart placed fourth after a tight race against Newcastle. We kicked off racing on Sunday with our women's Champ doubles. Fran Bratt and Anna Smart missed out on the final after coming fifth in their heat while Lucy Ryan and Chloe Knight raced well to come away with a third place in the final. Our beginner sculler Kate Rice raced a single again, this time in Tier 2, coming away with fourth, a good result for the new sculler. Some of our men's squad also raced in Champ doubles with Rory Harris and George Lawton placing second behind a fast Irish composite. Sean O'Mahony and Franklin Hamilton also raced a Champ double placing fifth. Later on in the day our quads raced. First up our men's Champ quad of Olly Dix, Luke Reiser, Laurence O'Connor and Alex Badcott raced well to place fourth. Our women's Champ quad of Sophie Lewis, Beatrice Roe, Kate Lyster and Emily May just missed out on qualification for the final, coming fourth in their heat. Overall it was a good weekend for us with some encouraging results. We're looking forward to getting back to training and getting ready for the next few weekends of regattas including Reading Amateur Regatta, Henley Women's Regatta and Marlow Regatta before the big one, Henley Royal Regatta.